Are you planning to hire a professional classical guitarist for your event? I'm committed to excellence and making of your event a beautiful memoir and experience for you and your guests, plus I'm very easy to work with. 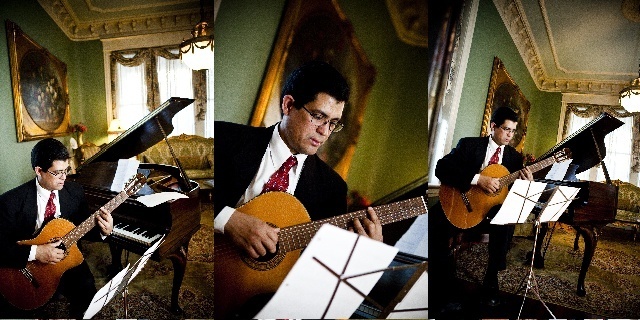 I play the classical guitar and the organ regularly for weddings, birthdays, corporate functions, birthday parties, etc., in the Charlottesville and Richmond areas, all Virginia, Washington DC, Maryland, North Carolina and West Virginia. I also travel anywhere in the USA and overseas. I have a long music list, but you can choose almost any music you like and I'll arrange it for you at no extra cost if it's not in my repertoire. I carry my own guitar amplifiers, which can also be used outdoors without electricity. Musical styles include: Classical, Pop/Movie/Folk/Celtic/Irish/Jazz songs, Hispanic, Spanish/Flamenco, Brazilian and Therapeutic music. Thank you so much for the beautiful job you did for our wedding! The music was perfect. You added such tenderness to our ceremony. Thank you for arriving early and sitting through the heat! We appreciate your talents! Best - Meredith & Jose (7-11-2011). (Click on some of the titles to watch a video performance). This is a list of some of the music I've been requested to perform.